The accommodation is situated above the business 'Luther & Co' with it's range of gorgeous gifts and eclectic one offs .The first floor consists of a very attractive and comfortable lounge with large bay window, 40" flat screen TV, DVD player, free unlimited wi-fi, pebble flame effect electric fire and leather settees with reclining seats. On the same floor you will find the kitchen diner with oven, ceramic hob, microwave, dishwasher, fridge freezer and many other appliances that you'd expect to find in a well equipped kitchen. Also included is all the cutlery, crockery and cooking utensils you're likely to need. On the second floor is a large well lit bathroom with bath and separate corner shower plus two heated towel rails. Towels,toiletries and bath mats are provided. The spacious bedroom has mirror front wardrobes giving ample shelf, drawer and hanging space. The super king sized bed has a deep pocket sprung mattress, all bedding and extra pillows are provided.This room also has a flat screen TV. A single folding bed complete with sleeping bag, pillow and liner OR travel cot (bedding for cot not provided) and stair gates are available. Please speak to Jean or Keith. Despite being situated on the main street the apartment is exceptionally quiet due secondary glazing and the thickness of 200 year old walls! Aberconwy House, built in the 14th century and now in the care of the National Trust, is 2 doors down whilst Plas Mawr, an Elizabethan Town House built in the 16th century is 80 metres away and clearly visible from the large bay window. The picturesque harbour and quayside is just a 30 second stroll. Visible from the rear of the property is our stunning castle built by Edward 1st between 1283 and 1289. The town has many quality restaurants, pubs, coffee houses and shops all nearby. With an Intercity railway station having links to London and Holyhead only minutes away and a National and good local bus service running frequently to LLandudno and other nearby places of interest Conwy is an excellent location for non drivers. The Snowdonia National Park boundary is just 2 miles away and offers a huge range of outdoor activities including the recently opened Surf Snowdonia (7 miles) and Europe's Longest Zip Wire ride at Bethesda ( 20 mins drive). There are no fewer than 5 golf courses within 5 miles including Conwy's Championship Links Course. The world famous Bodnant Gardens ( National Trust) are just 15 minutes away and should not be missed. There really is so much to see and do within a few miles of Conwy. Parking in Conwy is not a problem, but in common with 95% of domestic properties within the town walls of this world heritage site (est. 1284) we are unable to offer private parking. Parking in the main street (ie outside the property) is restricted to 1 hour daytime but unrestricted 6pm to 9am.Parking in side streets at any time is totally unrestricted and free. However overnight parking in any of the car parks (5 mins walk) is just 60p (6pm to 9am). On your day of arrival we will save you a parking space as close as possible to the apartment for the unloading of your luggage and personal belongings. We,Jean and Keith, moved to Conwy in 1968 expecting to stay 2, maybe 3, years but the area weaved it's majic and 47 years later we're still here! Having run our own business in Conwy for 45 years we've 'retired' so now have time to really appreciate how much the area has to offer to both residents and visitors. The apartment has been our home for 39 of those years and we hope you love it as much as we do. toilet, combination tub/shower, bidet, Two heated towel rails. Towels and bathmats are provided. A pleasure to stay in a much loved home. The apartment is beautifully furnished throughout. The kitchen has everything one could possible need. The bathroom is huge with a great view of the castle from the window. We slept very well in the comfortable super king bed and the excellent double glazing meant we had no noise from the street. We didn't even hear those famous church bells!!! Conwy is an enchanting place to stay with the north Wales coast and Anglesey waiting to be explored. The only downside was that we found it difficult to source food to cook in our excellent kitchen as the only supermarket was being refurbished. However the number of local places to eat meant that this was not a big problem. Conwy is a lovely town at the mouth of the river of the same name. This property is located in the centre of the town and is therefore convenient for local facilities. The property is well appointed and thoroughly recommended. Beautifully presented apartment in a gorgeous, walled town. We loved our stay in Conwy. 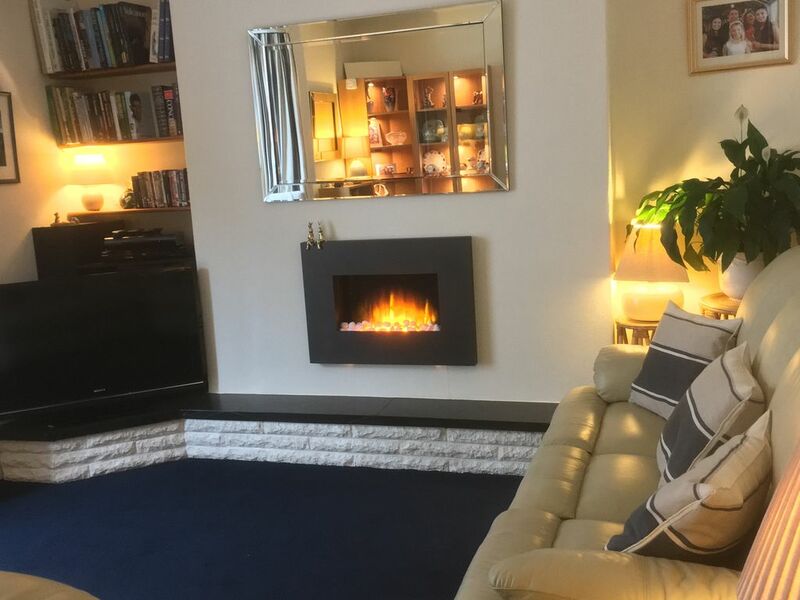 Keith made us feel very welcome and the apartment was extremely comfortable and situated in a perfect location to all attractions, pubs and eateries. A lovely welcome to Wales, everyone in town being so friendly and helpful. We were warmly welcomed by the owners, Jean and Keith Dorsett, who held a parking spot for us in front of the apartment. We were thrilled with the apartment and all of the home touches they provided. The location was right in the heart of the walled city, just a few steps to the castle, but really quiet. We heard none of the street noise within the apartment. If we were to return to this area of North Wales we would be sure to book with the Dorsetts again. Thank you so much for making our stay a wonderful one. Appartment had everything you could possibly need, with extra nice touches such as toiletries and local maps where Jean and Keith had took time to pinpoint local restaurants / parking spaces..we were welcomed by them at train station and shown property along with a few gratefully received recommendations, and bottle of wine & chocolates. Have to add that in conversation we mentioned that our wedding anniversary was later in week, and when day arrived we awoke to find Jean & Keith had posted card thru door, lovely. Rates are subject to change until bookings are confirmed. Deposits are non refundable.